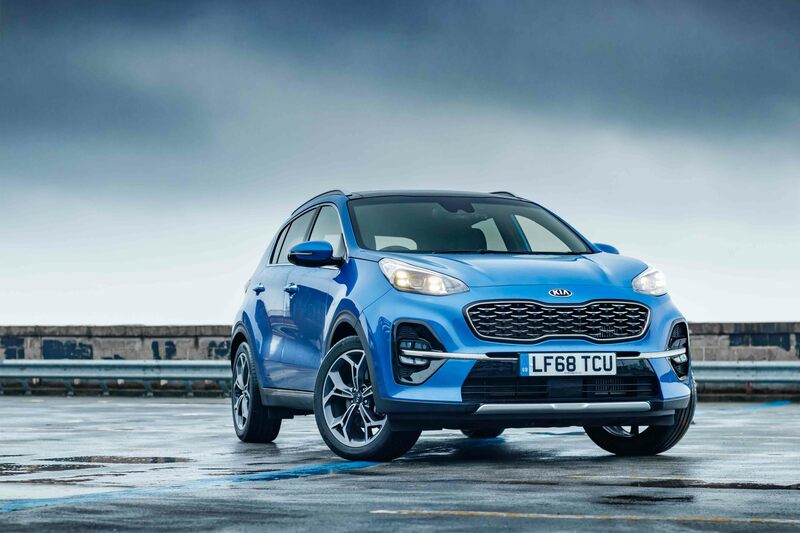 THE Sportage is Kia’s best-selling model in the UK so it’s no surprise that to keep ahead of the game they’ve introduced a face-lifted model that not only looks better both inside and out but introduces new tech as well as new engines. 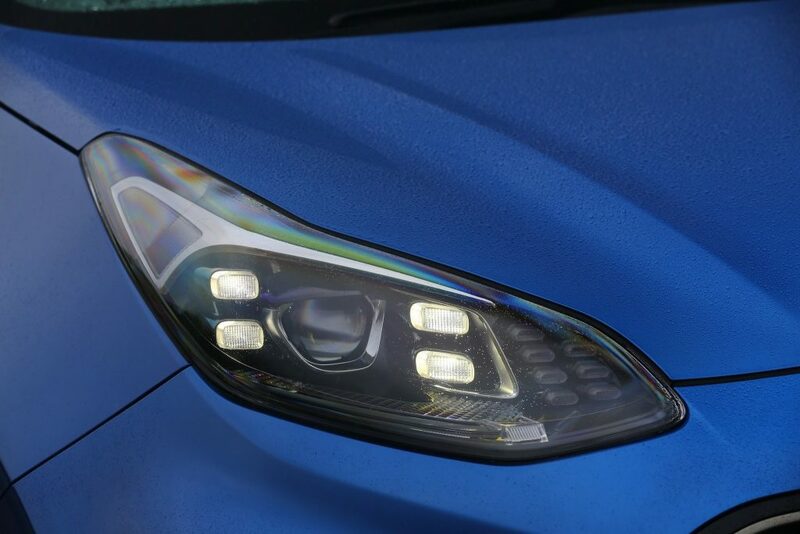 On the outside the new Sportage features a larger “tiger-nose”, a redesigned front bumper and new full-LED headlamps. At the rear the most notable difference is a new C-shaped LED light signature with the reversing light and reflectors integrated in the rear bumper. 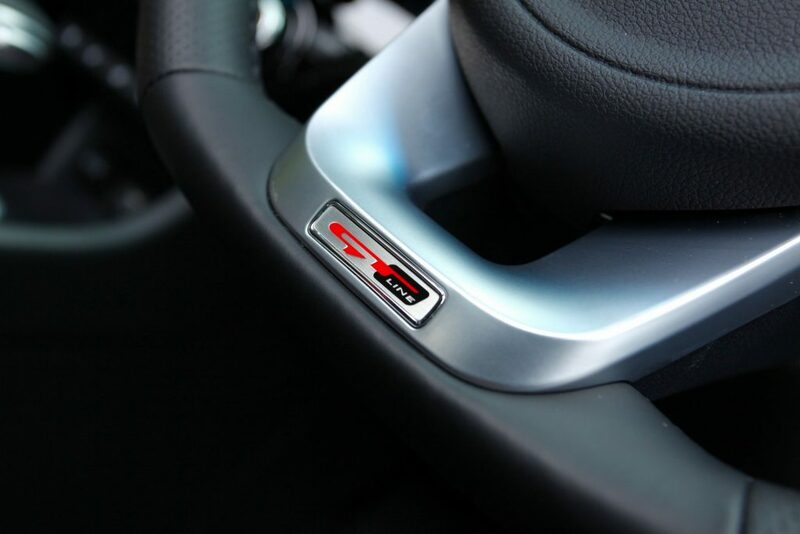 There’s plenty of chrome accents mixed with either matt or satin blacks too – dependent on which trim level you choose. 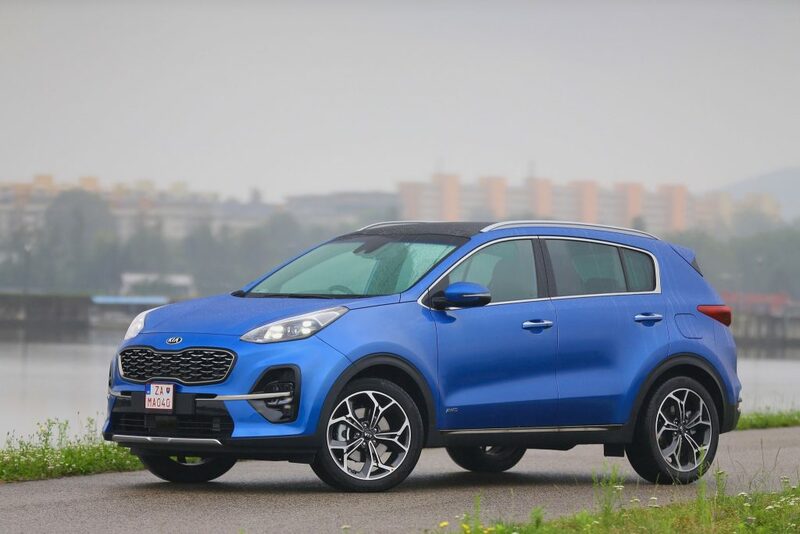 Overall, the new Sportage looks more “chiselled” than the previous model and in top-of-the-range GT-Line and GT-Line S trim it looks decidedly sportier too with bigger 19in alloys, LED rear lights and diffusers both front and rear in contrasting colour. 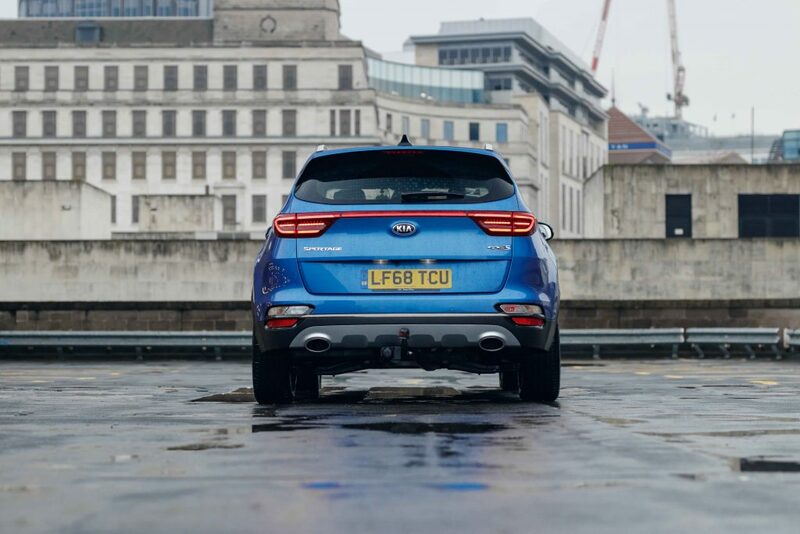 Trim levels are the usual Kia fare: 1, 2, 4, GT-Line and GT-Line S. There is also an ‘Edition 25’ version to celebrate 25 years of the Kia Sportage (£25,655 OTR) which features a 1.6 GDi petrol engine and manual transmission but has many of the higher-spec features such as uprated JBL sound system, bigger alloy wheels, cloth and leather upholstery, premium paint colour and 8in touchscreen with Sat Nav. The line-up of petrol engines remains the same in the upgraded Sportage but with minor modifications with buyers able to choose between two powerplants – the 1.6 GDi non-turbo unit which develops 130bhp and 161Nm of torque and the turbo-charged 1.6 T-GDi which kicks out 174bhp and 265Nm of torque and is also available in all-wheel-drive with a 7-speed dual-clutch auto box if you wish. The 1.7 diesel unit has been replaced by a more efficient 1.6 CRDi unit with power outputs of either 114bhp or 134bhp with the more powerful unit also being available in AWD with Auto gearbox. The most powerful (and most interesting) engine is the new 2.0-litre CRDi diesel (only available on GT-Line and GT-Line S models) which uses mild-hybrid technology to deliver greater efficiency. This will also become available on the 1.6 unit in 2020. Kia are calling this technology EcoDynamics+ and it involves a compact 0.44 kWh 48-volt battery which extends engine “off time” using a new Mild-Hybrid Starter-Generator. Still with me? Okay, all you need to know is that when braking or coasting toward a junction or downhill the system recuperates energy to the battery which can then be used to provide more power, more efficiently when you’re accelerating. Or it can actually turn OFF the combustion engine when decelerating with the MHSG then re-igniting the engine when you press the throttle. Simples –and you won’t even notice the switch-over. However, you will notice the acceleration as this engine provides 182bhp and a 0-60mph time of just 9.2 seconds which ain’t bad for a mid-sized SUV. With a combined mpg figure of 53.3 and CO2 emissions of just 141g/km it shouldn’t cost a lot to run either. 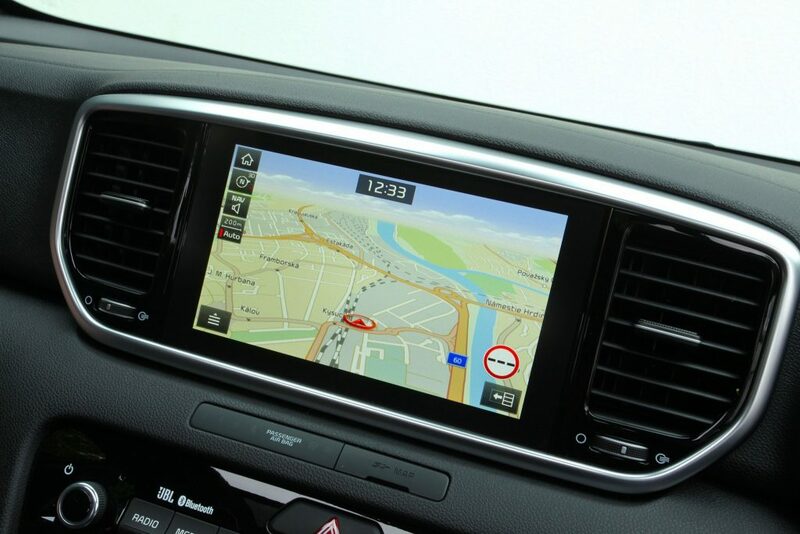 All new Sportage versions now come with Intelligent Stop and Go too. Grade ‘2’ (from £22,405 OTR) gets 17in alloys, 7in touchscreen with Sat Nav, reversing sensors, auto wipers, auto dimming rear mirror, dual-zone air con, heated front seats, Lane Keep Assist and High-Beam Assist. Step up to grade ‘4’ (from £27,260 OTR) and you get a larger, 8in touchscreen, panoramic sunroof, black leather upholstery, 10-way driver’s power-assisted seat, engine stop/start button with Smart Entry, rear USB charger, heated steering wheel, 360-degree around view monitor, a 4.2in LCD TFT colour information display and an 8-speaker JBL premium sound system with sub-woofer, external amp and front centre speaker. Outwardly there’s black wheel arch body mouldings, silver-coloured front and rear skid plates, LED bi-function headlights, front parking sensors and 19in alloys. GT-Line (£25,510 OTR) sits in the range between grades ‘2’ and ‘4’ and has sporty styling flourishes which mark it out as a more dynamic version. These include exclusive 19in alloys, LED Bi-function headlights with adaptive lighting system and dual exhausts (CRDi only). 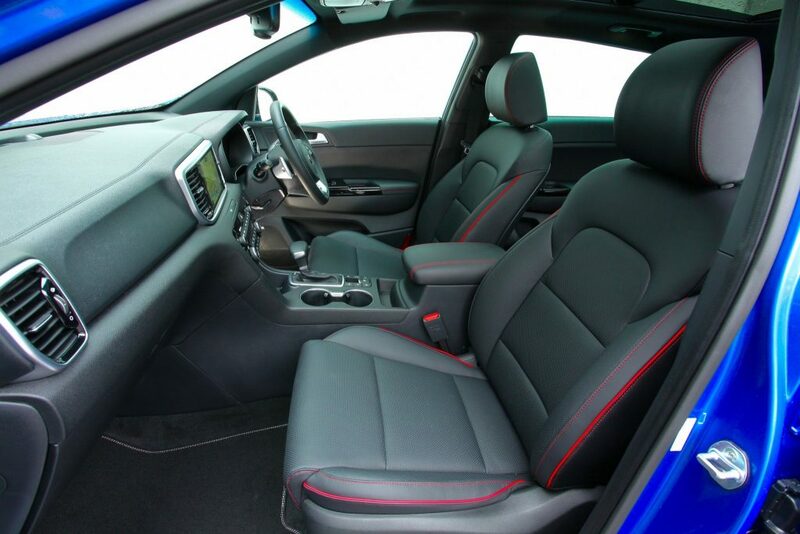 On the inside there is black leather with red piping and stitching, a high-gloss black centre fascia, stainless steel sill pedals and a flat-bottomed, leather covered sports steering wheel with paddle-shifters. Top-dog GT-Line S (£31,245) offers all of the above plus such things as adaptive cruise control, panoramic sunroof, heated and ventilated front seats, smart powered tailgate, wireless phone charger, Forward Collision-Avoidance Assist (with pedestrian detection) and Blind-Spot Collision Warning. I’ve been driving a Sportage GT-Line S 2.0 CRDi 48V model equipped with an 8-speed torque convertor auto gearbox and I must admit I felt rather spoilt. Inside the Sportage you’ll find quality soft-touch materials aplenty. Kia really are getting very close to the best the Germans can offer in this department with fit and finish being excellent. The 8in infotainment screen is almost on par with BMW and Audi too with sharp, hi-res graphics and an easily-navigated menu system. Thankfully, the climate controls are banked together below screen and made up of large, easy-to-hit buttons as well as chunky rotary dials. At first glance it looks like too many buttons but in reality, you soon get used to finding the most often used quickly enough. 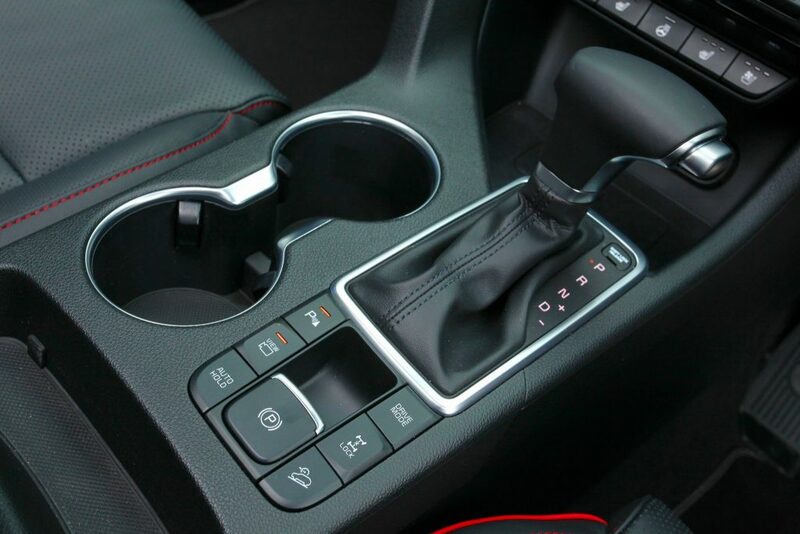 With alloy pedals, red stitched black leather and flappy-paddle shifters the GT-Line S feels very sporty before you’ve even started her up. The only fly in the ointment is the view out of the back window which is a little restricted due to a narrow rear screen and wide C-pillars which can make looking over your shoulder at junctions a tad difficult. The heated seats and steering wheel came in useful during a cold snap in February, as did the wireless phone charger tucked down in the centre console. I also found the JBL sound system to be good – but not outstanding. I was expecting the Sportage to feel a little different on the road due to its mild-hybrid system but in truth I didn’t notice any difference at all except when the engine shuts down approaching a junction – but if you’re not looking for it I doubt you will notice. The 8-speed gearbox shifts sweetly enough – short of sporty but this is a family SUV after all and not a Porsche Macan chaser. Ride quality is definitely on the soft side too with some body-roll around corners if you’re trapping-on a little but, again, this is perfectly acceptable and no worse than you’ll find in rivals such as the Nissan Qashqai or Renault Kadjar. It rides our pock-marked roads very well – part of the reason, I’m sure, SUVs have become so popular. The steering had more feel to it than I was expecting and it loads up nicely at motorway speeds so you don’t need to constantly adjust. Overall I found the Sportage to be an excellent long-distance cruiser, taking a trip to Chester, via A-roads and back again on the motorway, in its stride. 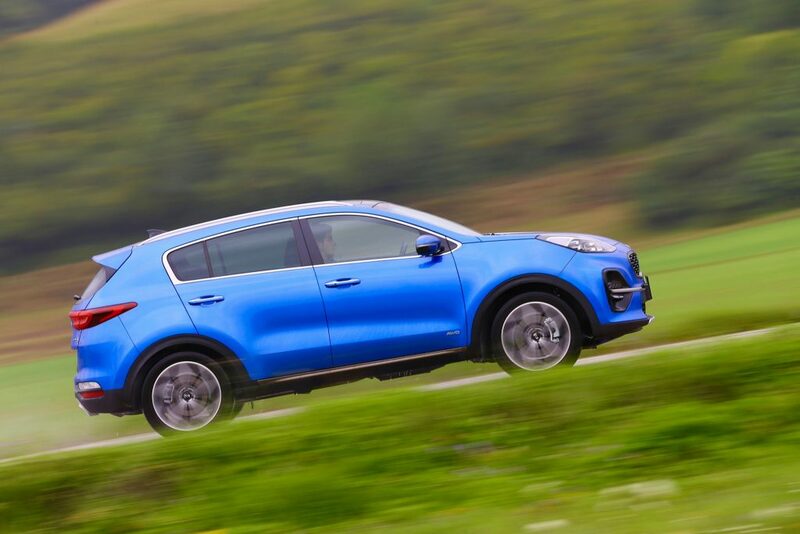 Kia’s tagline is “The Power to Surprise” but it’s hardly surprising the Kia Sportage is such a hit in the UK because it does everything so well. Not outstandingly well, but easily well enough to impress when you take into account its price. It’s roomy too with plenty of room in the rear and boot for a family of 5. 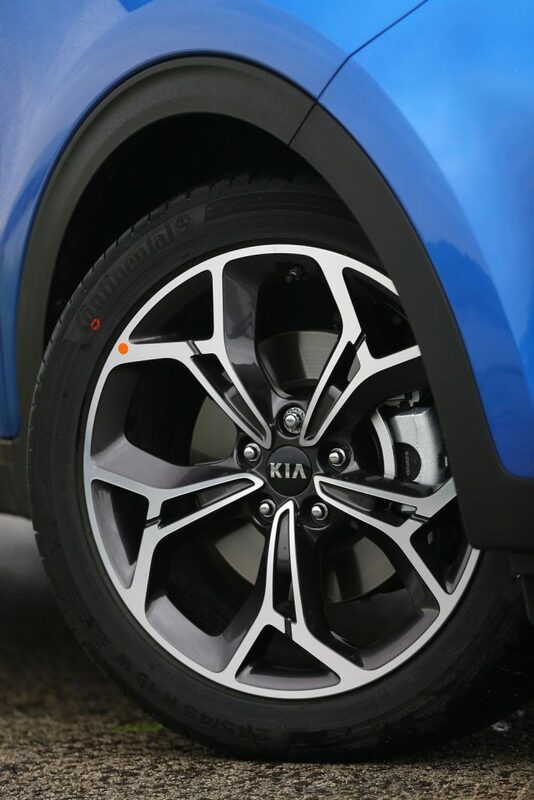 The model I drove is, perhaps, a little too pricey though and Kia are right to point out that the 1.6 diesel, 2-wheel drive will probably be their biggest seller as it offers everything people want with some impressive extras thrown in – if you choose the right trim level. Let’s not forget Kia’s excellent 7-year, 100,000-mile warranty either and you should be onto a winner.